Climate change is projected to contribute to more extreme weather events, including more extreme heat days, increases in frequency and intensity of heavy precipitation events, more intense hurricanes and storm surges, increases in wildfires, and increases in likelihood of coastal flooding due to sea level rise. These extreme weather events pose a direct risk to health and healthcare operations and delivery. During Hurricane Sandy, hospitals in the New York City area had to evacuate patients due to flooding and power outages. In 2017, the United States saw how communities were devastated and delivery of healthcare was affected by extreme weather events, such as Hurricane Harvey, Irma, and Maria and the record-setting wildfires in California. Nurses are often among the frontline providers caring for communities and individuals who are impacted by extreme weather events. Helping the public understand the connection between climate change and more intense weather events will bring attention to the need to build community resilience and preparedness. Nurses can also work within healthcare facilities to ensure that climate resilience is incorporated into disaster preparedness, as hospital operations and the ability to deliver care may be directly impact if a facility is located within a disaster region. 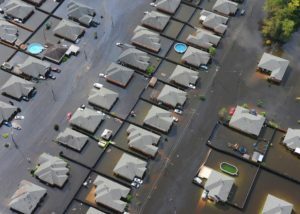 Health departments and acute care facilities should similarly include climate risks into adaptation planning and disaster planning as the public health and emergency workforces may need to respond to increases in individuals seeking medical care. The UK Health Alliance on Climate Change, which the Royal College of Nursing is a member of, has been leading efforts in the UK to advocate for responses to climate change that protect and promote public health. In effort to raise awareness on the UK Health Services unpreparedness against climate change, the Alliance sent a letter to the Health Secretary highlighting the lack of adequate adaptation plans in place for NHS providers and the direct risk that extreme weather events pose to public health and health service delivery. They called on the government to ensure resilient infrastructure and to implement and enforce adaptation plans to protect against the threats of climate change. Various resources and educational opportunities on disaster preparedness are available on the American Nurses Association’s website, including an issue brief addressing the legal, ethical, and professional considerations of disaster medical response. Society for the Advancement of Disaster Nursing: Resources and links on on disaster preparedness and response, with sections for resources on vulnerable populations including children, older adults, and those with special needs. National Center for Disaster Preparedness: A organization that carries out research to improve preparedness and response to large-scale disasters and develop best practices. Health Care Without Harm’s report, Safe haven in the storm: Protecting lives and margins with climate-smart health care, discusses the impact of extreme weather disasters on human health and hospital operations and how preparing for disasters can save lives and costs. Smart Hospitals Toolkit from the PAHO/WHO to help build disaster and climate resilient health facilities.